WhiMSy love: Gelarti Stickers Review & GIVEAWAY! 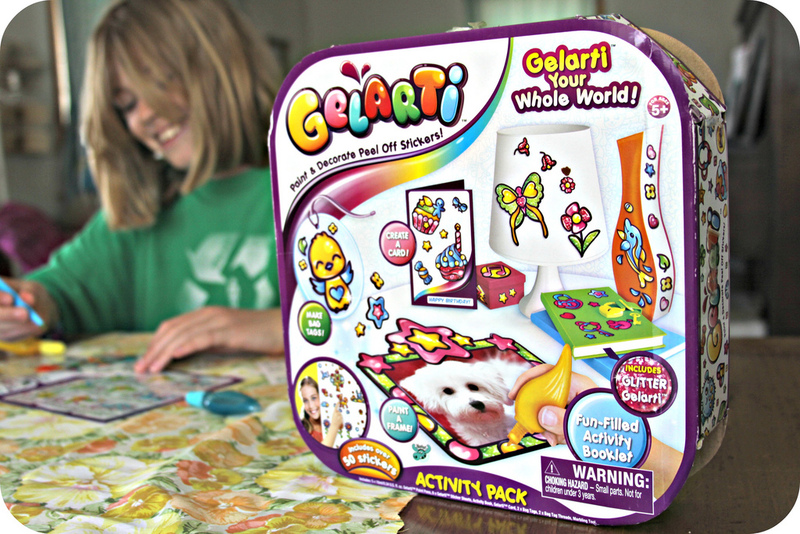 Gelarti Stickers Review & GIVEAWAY! 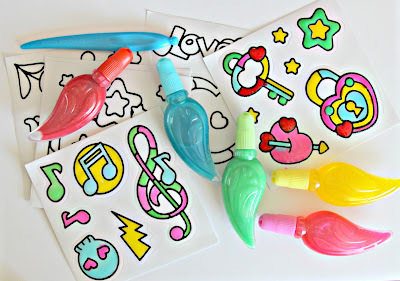 The kit comes with 5 tubes of gel paint pens (2 of them are glitter gel), a marbeling tool (that helps achieve swirly or dotty artistic effects on your stickers), 2 clear acrylic bag tags to decorate with your stickers, a frame to paint, a card to create, 50 stickers to decorate, & an activity/instruction booklet. I knew right away that his craft was perfect for the girls (ages 7 & 9) because, without me knowing, they snatched the box & got to creating all on their own. They didn't need any instruction from me. I did get a chance to play around with the stickers too. You have to leave them to dry for about 6 hours. (Best if overnight.) 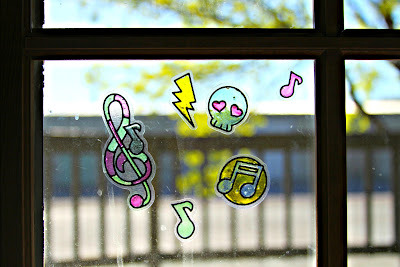 When you peel them, they look like little stained glass masterpieces. The sun shines through the color & is really pretty. I stuck some on my computer, but they didn't show up well on the dark background. So, we stuck a bunch in the windows.The girls have also attacked their walls & dressers, the bathroom mirror & the refrigerator. The girls give this kit 2 crafty thumbs up! 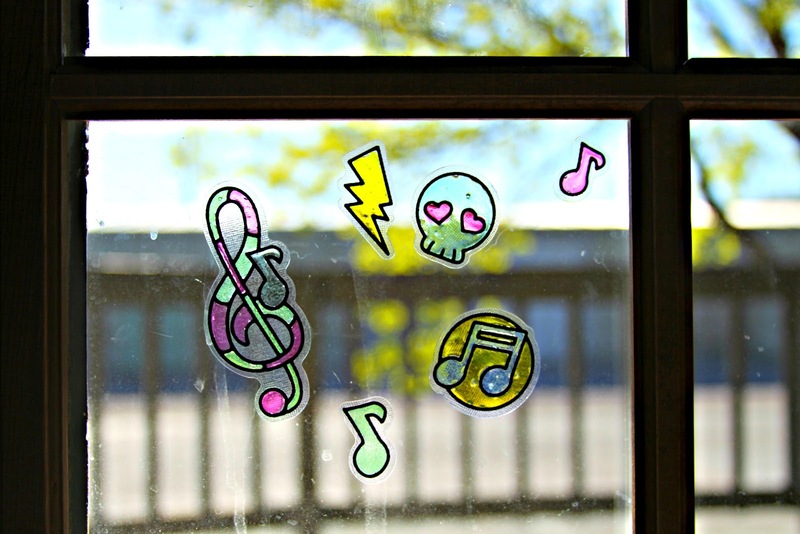 Choose from: Ocean/Mermaid, Nature/Butterflies, Forest/Creatures, or Funky Fun/Rock! Just leave a comment & I'll draw a winner this Sunday, April 29th! 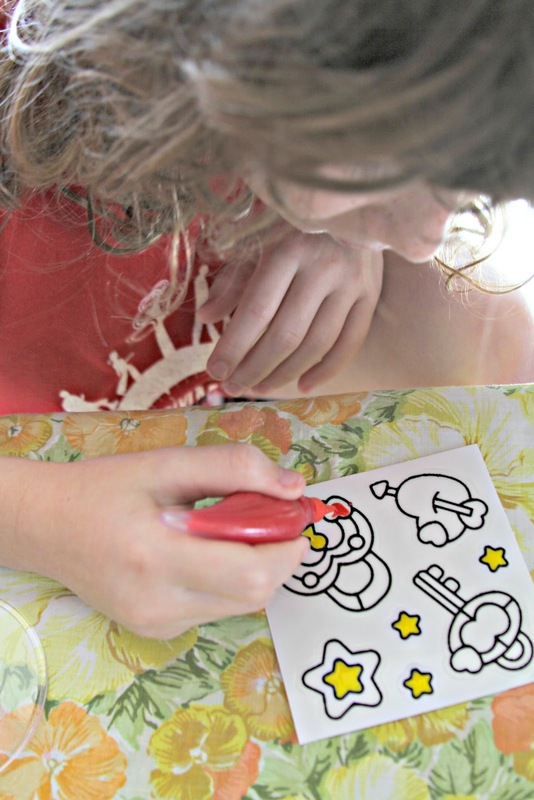 Click HERE to view a 30-second Gelarti Sticker commercial. 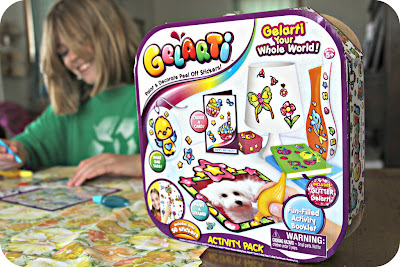 Disclosure: I received the Gelarti Sticker Activity Set as compensation for writing this post. All opinions expressed are my own. I review products I believe represent the interests of my audience, & products that correspond to my lifestyle of creativity. I will always give you my honest opinion. How wonderful to read about an Australian product and one I haven't seen. That looks like so much fun. Especially the fact that they are repositional. Your daughters look like they had a wonderful time. this looks like a great rainy day craft to squirrel away, what fun! although I am not sure if my son would get a look in lol. How cool! Looks like you guys had some real fun! Wow, neat. My daughter would have a blast. I pulled my stickers albums out from when I was her age and she was amazed! my girls! So FUN!!!! Thanks for sharing! These look like they'd be so much fun!! !